I’m taking a little different approach to this BrandingWire project. Martin Jelsema (a member of our team), with his close ties to the town – has put together a comprehensive brief on Estes Park, Colorado outlining their brand and what they want to accomplish. I’m stepping into the role of consumer and am going to try to experience the Estes Park brand from the perspective of a potential customer. My wife and I have small children and we’ve often talked about visiting Colorado and showing the children the mountains and all the natural beauty. Coming from Minneapolis, the trip is not too long and would be a great experience for our family. Two caveats – we’re not campers and we don’t ski. Is Colorado the right place for us? I jump to my Google browser and type in “rocky mountain national park” (cheating a bit because I know it’s close to Estes Park) – what a great place to see the mountains. Please note that we don’t know much about the area or even for what we’re looking, but we know we want a mountain experience. Ahh…this is starting out interesting. Check out the only paid result – it’s from EstesParkCVB.com. Well, I’m not going to cheat and go right to their site so I peruse some of the organic results for starting information on RMNP. Estes Park shows up on page one of these the organic results as well. Very impressed so far…an ad and an organic result on page one for this major attraction. 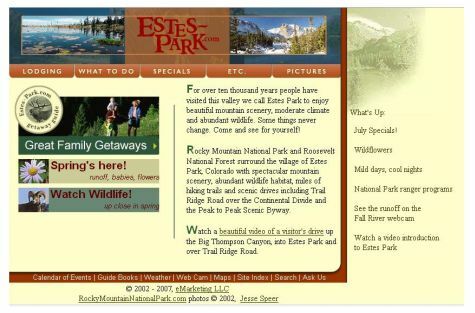 As a researcher, I’m getting the idea that the Estes Park brand is closely tied to RMNP. I click on the top six or seven results to learn more about RMNP. There is alot of information but not one definitive source – lots of bits and pieces. I get the idea that this is primarily a summer location where you can hike, fish, sightsee, etc. That’s what we need – now a place to stay. Like any good vacationer not familiar with the area, we’d like a central location from which we can branch out and return with ease. Remember, we’re not campers so we’re looking for lodging. Interestingly, most links for lodging lead me to an Estes Park page of some sort. They’re all different, but it seems like that’s the place to stay. I’ve seen alot of these pictures on other sites – I was really hoping to see the quaint mountain town greeting me with a combination of nature partnering with small town hospitality. We like nature and its beauty, but we also like to return at night to some quality dining and comfortable cabin lodging. I’m guessing that is what they offer, but my first reaction is that this is more rustic than we need. I do like the fact they have summer pictures showing – I was expecting to see alot of skiers when I first started this research mission. The majestic scenery of Rocky Mountain National Park combined with the home town hospitality of Estes Park transforms trips to the Colorado Rockies into dream vacations in paradise. Come for a day, a week, or more to visit this eastern gateway community to Rocky Mountain National Park. The first sentence confirms that this is indeed the small town atmosphere we need coupled with the incredible scenery of the mountains. I do get confused over the “gateway community” term though. Are they just a place to sleep and eat and then drive into the national park each day for all the activities? The next paragraph says they have all the hiking, fishing, etc. but now I’m unclear as to whether the town has that or RMNP has it. Next I look for family activities, but don’t see anything obvious on the front page.. I search around and find under “Things to Do” tab a link to Family Activities. Again, I’m hoping to see more family related images and information. Okay…let’s take a break from my consumer point of view and read Martin’s brief…. So, it looks like Estes Park is alot of what I thought it was which means they’re doing a good job of representing their brand online. It looks like their main challenge is increasing their tax base via increases in tourism while not ruffling the feathers of its residents who prefer little or no development. Being mostly a summer destination, they’re even looking to extend their season into Fall and Spring. I read some more from their town site and from a marketing perspective, I was impressed with the plan and methods being used to reach their customer base. They’ve segmented their audience into three markets based on geographical location, income, family status, and age. With that data, they’ve put together a comprehensive marketing plan that includes paid search, banner advertising, print advertising, 30-second television spots, direct marketing, radio spots, and public relations. They haven’t missed much! But something was nagging me about their brand image so I decided to sleep on it…the next day it hit me. I didn’t feel like the town stood on its own. Obviously, the activities surrounding the Rocky Mountain National Park are a huge draw and they need to be highlighted, but Estes Park has a very rustic, small town feel that is unique to the area. Yes, I have limited knowledge of Colorado, but as far as I can tell there aren’t other towns like that close to the RMNP. Why not hit me with that message? I decided to search on “Estes park” in my Google search engine to see if there was other information I missed. The first result is, of course, Estes Park, but the url is different than their paid search ad??? I click on it and am greeting with more of what I needed to see. Look what is right in plain view on the main page – “Great Family Getaways” plus a banner talking about Spring which fits with their goals of expanding their seasons. The text leads me to believe that this town is its own destination with options to take in the surrounding national parks. I feel better about this interaction with this brand. Why the two experiences and messages? 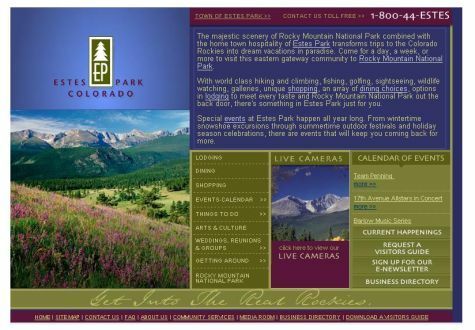 Now, in all fairness to Estes Park, I have not seen other marketing efforts such as collateral, TV ads, etc. But if they’re going to market to other Midwestern states outside of Colorado, the web presence should be more consistent and unified. We’re not the only family that uses the Internet to search for vacation destinations. I’d also recommend something close to what ExploreMinnesota.com did with My Favorite Minnesota. They used user generated content to promote every angle of the state. This doesn’t break the bank to produce and allows people not familiar with the area to see, hear and understand what is so wonderful about visiting. Estes Park, Colorado looks incredible and I want to visit…soon. I hope they unify their branding message and keep focusing on family tourism. We stay longer than a day, we eat out, we shop and we spend money to give our kids an experience. We also look for off-season deals which could lend towards them having success with extending their brand to other seasons.